Jan. 16, 2019: It is only January, but the indoor track and field teams have already been breaking records for the 2018-2019 season. In the first week of the year, the Bronxville boys exceeded all expectations at the Hispanic Games. Matt and Alex Rizzo, Tommy O’Connell, and Seamus Watters ran the sprint medley relay (SMR) with hopes of qualifying for Nationals in March. They needed to run a 3:37 to qualify for the coveted New Balance National Championship race. On the first day of the two-day meet, Alex led off the SMR running the 400m and was followed by Seamus and Tommy, who each ran a 200m leg. When the baton was handed off to Matt, who was anchoring the relay in the 800m, the Broncos were in third place, about 30m behind the lead runner. Matt took off and managed to catch the leader to win the race in 3.33. Not only did the Bronco SMR qualify for nationals, they also broke the meet record and earned the #2 ranking in the U.S. It was no small feat to finish first at the Hispanic Games, which included 270 schools from New York, New Jersey, Connecticut, Pennsylvania, Delaware, and Maryland. The day after the SMR, Matt competed in the mile. The winner of this race would qualify for the high school mile at the Millrose Games. Matt took an early lead but fell back to sixth as other boys decided to make a move. With just one lap to go, Matt moved up to third, and on the final straightaway, he managed to kick and passed the two lead runners to win the race. His new personal best time of 4:17.32 qualified him for both the Millrose Mile and Nationals. He was named Outstanding Male Track Athlete of the Hispanic Games. 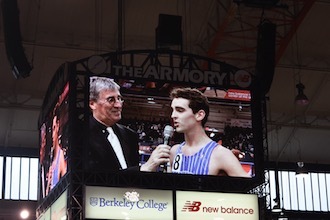 A photo of the jumbotron showing Matt Rizzo being interviewed after winning the mile at the Hispanic Games. Photo C. Rizzo. The Bronxville girls’ SMR relay team had some fast times of their own at the Hispanic Games. Eve Balseiro (400m), Caroline Ircha (200m), Sabrina Mellinghoff (200m), and Caroline Brashear (800m) placed second overall in a time of 4:15.6, and the second Bronxville SMR team, Betsy Marshall (400m), Alisa Kanganis (200m), Millie Koenig (200m), and Natalie Weiner (800m) placed fourth in 4:17.4. On January 9, the Bronxville girls competed again at the Armory, this time at the Millrose Games trials. The Bronco 4x400m relay team, Marshall, Brashear, Mellinghoff, and Balseiro, ran a 4:01.45, a time that qualified the team for the Millrose Games. Balseiro ran a 57.45 split, which is the fastest 400m split in Bronxville School history. Eve Balseiro setting a new school record for her split in the 4x400m relay at the Armory. Photo by C. Balseiro. 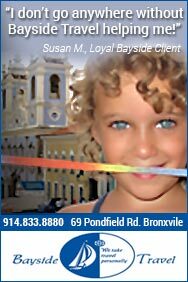 This past Sunday, the Bronxville boys’ and girls’ teams won their respective league championships. The girls’ team placed first in 12 out of 17 events and missed scoring only in the race walk. 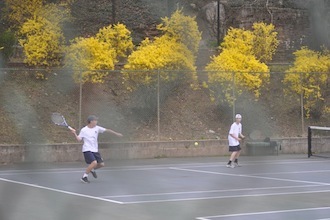 Bronxville won leagues with 249 points and was followed by Pawling with 78. The girls’ team was particularly strong in the pole vault. Jules Gravier won the event with a height of 9-3, placing her number 2 all-time for Bronxville. Molly Palma placed second (8-9), earning the number 3 spot all-time for Bronxville. Boys won leagues with 13 first- or second-place finishes. Bronxville is in League 3C, along with Pawling, North Salem, Edgemont, Rye Neck, Haldane, Hamilton, and Tuckahoe. First- and second-place finishers from leagues are listed below. Pictured at top (rotating): Boys’ SMR placed first at the Hispanic Games: (L to R) Alex Rizzo, Tommy O’Connell, Seamus Watters, and Matt Rizzo (photo by C. Rizzo); first-place 4x400m relay at the Millrose trials: (L to R) Betsy Marshall, Caroline Brashear, Sabrina Mellinghoff, and Eve Balseiro (photo by Jim Mitchell).